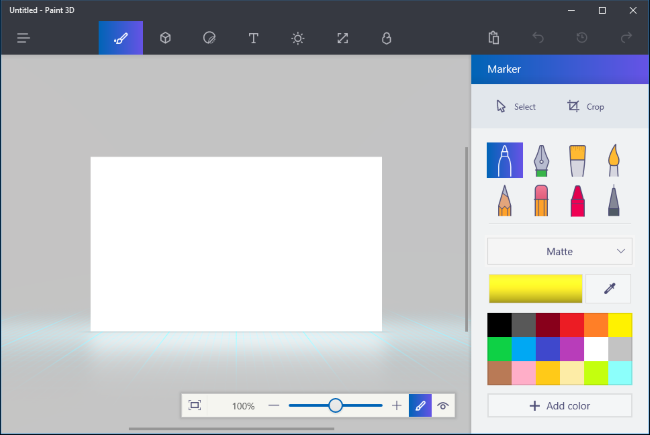 Paint 3D is a new app added in Windows 10 with creator’s update. With this tool, you can create 3D models, share them online or even with print with a 3D printer. Let’s see how to use this app and create 3D models. This is not just the latest version of Paint. It’s a 3D modeling app, that allows you to make your own 3-dimensional models and build scenes with several 3D models. You can download these scenes or models from Remix 3D Microsoft website or upload your own and share with others too. Paint 3D has few additional advanced features as well. for instance, you can export your models from Paint 3D to .3MF or .FBX files allowing you work on them in other apps as well. you can even print your Paint 3D models in a 3D printer with the help of 3D Builder app in Windows 10. If you have upgraded your Windows 10 with Creator update, you’ll see Paint 3D in the Start Menu. Upon opening it, you’ll be presented with a welcome screen with tips & tricks, video and challenge to assist you to embark your creative journey. Tips & Tricks tile offers detailed instructions on various features and how to use them. There is video tutorial as well, which looks like an ad more than a tutorial. And then, there is challenge – Put a Sticker on it. you can start the challenge to understand different how to work with Remix 3D website. We’ll straight away move on to the features where you can create 3D models on a 2D canvas. Let us start with an empty scene to understand how this app works. On welcome screen click New or click menu and then New. You’ll see an empty white sheet. This is a 2D canvas and a background for your 3D model. Now let’s fill it colors quickly. On top the screen, you’ll see Toolbar in that, from the left the click on first icon ‘Tools’ to use brushes and other tools. Choose the brush and color shade to paint canvas. With the Canvas pane – the sixth icon from the left in the toolbar, you can resize your canvas. You can make it either smaller or larger. In case you didn’t like what you painted, you have the option to import images from other applications as well. first, download the one you want to use and save it as an image file on your computer. Now, in Paint 3D, click Stickers, the third one from the left in the toolbar. Next, click Custom Sticker, and then Add Sticker and choose the image you saved earlier. You can adjust the size and position according to your likings and click Stamp button once done. Now, you’ll have this image as your background. You can insert 3D objects in your canvas through various methods. 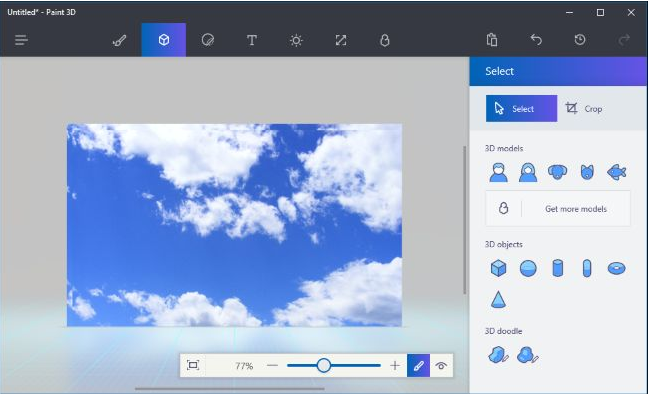 You can use integrated tools in Paint 3D for basic models, you import the one’s which were created using other apps or you can add them from Remix 3D website. Paint 3D app supports FBX or 3MF file formats only. To begin with, click the box icon second from the left in the toolbar. That’s the 3D Model icon. You can select from ‘3D models’, ‘3D objects’ and ‘3D doodle’. To insert a 3D object or a model, click the respective panes, select a model and color. Then, click on the scene where you want to place the model. With help of your mouse, you can reposition and resize it. you can rotate the model in different directions by using the buttons around the model. Click outside the object once done. If you think you need to change the position of the model in the later stage, click on Select and then click on the model and do the adjustments. 3D doodle lets you draw your own models. You’ve Sharp Edge tool to draw sharp edge model and Soft Edge to draw soft edge models. To paint the models, go to tools – the first icon and select colors – dull or polished, texture, brushes according to your preferences. For example, to get gold color, choose a yellow color and Polished Metal, and to paint the entire model, choose the bucket icon. If you want to view your painting in 3D, click the eye icon at the bottom of the screen. Click-and-drag to view the painting in different angles. To view in 2D, click the button on the left-side of it. Paint 3D has some basic stickers to use it. Just like your background image, you can import an image and apply that as a texture to your model. You can search for objects and use them from Remix 3D if you don’t want to create all the models by yourself. For that click the last icon Remix 3D on the toolbar. The models are straight-away placed in your scene by Place in Project button. You can even insert 2D text either on the object or on the canvas or floating 3D text in your scene. Click T – text from the toolbar and select the tools according to your choice. And the last one – Effects pane, next to the Text icon on the toolbar. It gives colored lighting effects and you get to choose only one, which will be smeared to the whole scene. Now, the final product is ready to be saved. Click menu, you choose ‘Save’ to save it to your local folder or ‘Upload’ to Remix 3D. If you want a print, click on the print option. Using paint 3D is so much fun. And remember, the maximum size you can create is 64 MB. In case you lost your personal photo while experimenting or for any other reason, know that with the help of a photo recovery tool, you can get back your photos of all image types. It can recover photos from your desktop, memory cards or even from hard drives.